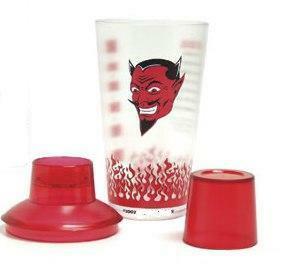 Celebrate happy hour in Hell with the Red Devil Cocktail Shaker. This 8-1/4" (21 cm) tall, 12 ounce (355 mL) plastic shaker is decorated with red flames, a grinning devil and the recipe for the Red Devil cocktail. Use the handy ounce indicators on the side to ensure a cocktail with proper proportions. Each shaker breaks down into three pieces, including a built-in strainer and shot glass cap. We've sold out folks, sorry, but once they are gone it's almost impossible to get any more. If we ever do we will reactivate this product.